1) Biomarkers of free radical damage applications in experimental animals and in humans. Free Radic Biol Med 26(1-2), p202-226 (1999), de Zwart LL, Meerman JH, Commandeur JN, Vermeulen NP. 2) Chemistry and biochemistry of 4-hydroxynonenal, malonaldehyde and related aldehydes. Free Radic Biol Med 11(1), p81-128 (1991), Esterbauer H, Schaur RJ, Zollner H.
3) Malondialdehyde and thiobarbituric acid-reactivity as diagnostic indices of lipid peroxidation and peroxidative tissue injury. Free Radic Biol Med 9(6), p515-540 (1990), Janero DR.
4) Improved analysis of malondialdehyde in human body fluids. Free Radic Biol Med 20(2), p251-256 (1996), Jentzsch AM, Bachmann H, Furst P, Biesalski HK. 5) Reactions of 1-methyl-2-phenylindole with malondialdehyde and 4-hydroxyalkenals. 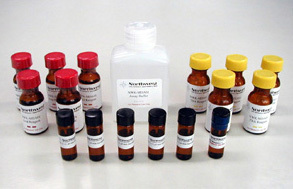 Analytical applications to a colorimetric assay of lipid peroxidation. Chem Res Toxicol 11(10), p1176-1183 (1998), Gerard-Monnier D, Erdelmeier I, Regnard K, Moze-Henry N, Yadan JC, Chaudiere J. 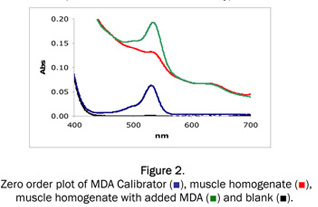 6) Free and bound malondialdehyde measured as thiobarbituric acid adduct by HPLC in serum and plasma. Clin Chem 37(8), p1423-1429(1991), Carbonneau MA, Peuchant E, Sess D, Canioni P, Clerc M.
7) Determination of malondialdehyde as dithiobarbituric acid adduct in biological samples by HPLC with fluorescence detection: comparison with ultraviolet-visible spectrophotometry. Clin Chem 47(9), p1725-1727 (2001), Lykkesfeldt J. 8) Grapefruit seed extract moderates morphologic, functional and biochemical evidences of epidoxorubicin-induced testicular toxicity. J Med Sci 7(4), p650-654 (2007), LC Saalu, T Kpela, LAJ Shittu, OA Ashiru. 9) Sildenafil extends survival and graft function in a large animal lung transplantation model. Eur J Cardio-thoracic Surg 29, p288-293 (2006), Stephan Korom, Sven Hillinger, Markus Cardell, Wei Zhai, Qiang Tan,Andre Dutly, Boris Leskosek, Walter Weder.